What Rights do we REALLY Need? We have rights! These right are laid out in the Bill of Rights as listed in the United States Constitution. This means that while there might be some restrictions on these rights, such as no bang bang for felons, these rights can not be outlawed by one of the very groups that these laws protect us from i.e. the government. The problem here is that some of these Judges have taken the mention of the “militia” to mean the state, or federal government, will the Constitution says “the rights of the people to keep and bear arms, shall not be infringed”. We are the “people” not the government, who is supposed to get their authority from us, the people. Recent Supreme Court opinions have even affirmed that the 2nd amendment applies to “the people” and that decision has been used to strike down a number of state, and city, law that banned people from owning hand firearms. The Gun Control crowd may have the right motives, like trying to cut down on the number of criminals who have access to weapons but, the question come up : how would they do this without violating the Constitution? It would be hard to, for example, ban the so called assault rifle when the supreme court in, I think it was the Miller case, had said that a ban against sawed off shotguns would invalidate its use by a ” well regulated militia”:. So it is actually the right of the people that makes it possible to arm the military, and that barring the people from owning firearms would also ban the military from the same, as the military/militia is made up of citizen soldiers. 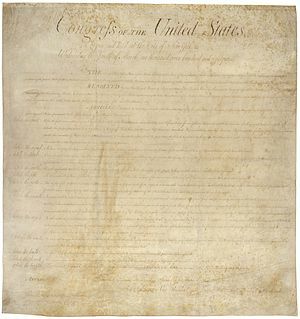 Even if the various “Gun Control” people were to ignore this fact and attempt to pass laws based on what they perceive to be our need, the constitution says this is our right, and since this is one of a number of enumerated rights the question come up : who will decide which rights we really need? Which other rights will they decide we DON”T NEED? The freedom of speech? Religious Freedom, or others. I hate that criminals can get access to firearms but, I also hate the idea that some bureaucrat could decide which of my rights I don’t need. I don’t believe that the law abiding citizens of this country should be punished for the crimes of others, and see this as a start down the road to tyranny. “Those who would give up Essential Liberty to purchase a little Temporary Safety, deserve neither Liberty nor Safety” so said Benjamin Franklin, and he was right. To close this off I will repeat the old saying “the price of freedom, is eternal vigilance”. I agree with Ben. But then I think of Montana and the lack of mass shootings out there. Anyone and everyone can carry a VISIBLE weapon, and I suppose that that in itself is a sort of deterent. No cowboy heroics are needed; just good ol’ common sense! And there are lots of meat eating critters up there, so it stands to reason that a gun is a good buddy to have. No one wants to be a bear’s entree. Or be left for the coyotes/wolves/mountain lions, etc. However, on the odd chance that Mr. Obama is re-elected, we may need a gun or two for self poreservation — if just to chase off the “rev-in-oors”, as Snuffy Smith used to call ’em! It’s not just guns I’m worried about, as Joe has opointed out on several ocassions. There are many freedoms that can be felled just by letting an overly eager/greedy/self-serving Congress or Judiciary pass just one key point. WE need an UNPAID Congress — in the respect that they get a minimum wage, just like me and you! No special benefits, just like me and you! They pay for everything we pay for! LET ALL MEN/WOMEN be truly equal. Previous PostPrevious Lets hear if for Sheriff Joe from Arizona. Next PostNext Scammers and Progress.